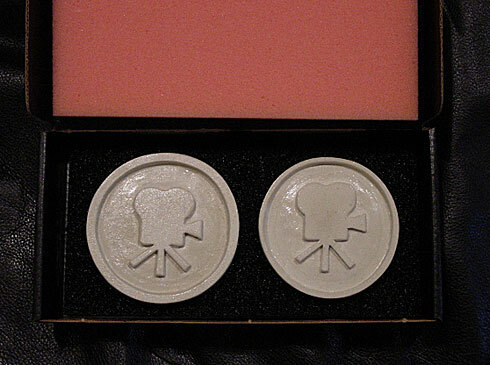 I wasn’t too happy with the medallions I made… so I had the guy who has made the real ones since 1956, cast me a smaller 3″ version (the originals are 6″). Needless to say, he did an unbelievable job! I just got the JAX Brown/Black Brass Darkener and it instantly turned the brass the color I wanted… that stuff is amazing! I then took some steel wool and polished the border and projector back to brass. I’m officially done with the medallion and am very happy with the results. I’ve learned a ton from this whole process and hope to do some more sandcasting in the future. I will be starting Part 2 and 3 this weekend. Let me know your thoughts! Before I start with Part 2, I should post an update to the progress of the medallion. I purchased some JAX Brown/Black Brass Darkener, it is an instant chemical oxidizer that will make the medallion look weathered. 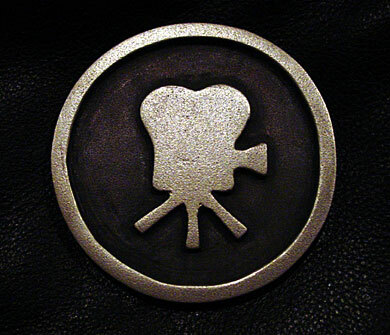 I’m going to make the inside of the medallion that dark weathered color, then the projector and border will be polished. I should have the chemical end of this week and will post photos as soon as I apply it. 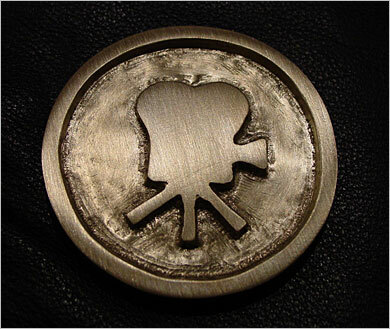 I took a medallion to a machine shop and had it sandblasted, it actually turned out better than I expected… let me know what you think. I wanted to see what would look better, sand texture background or polished. So I sanded and polished for about a half an hour and took a photo of the results. I still have some work to get it looking better and the photos don’t show the beauty of the brass… I’d like to know which way you think looks better. Post your comments below! 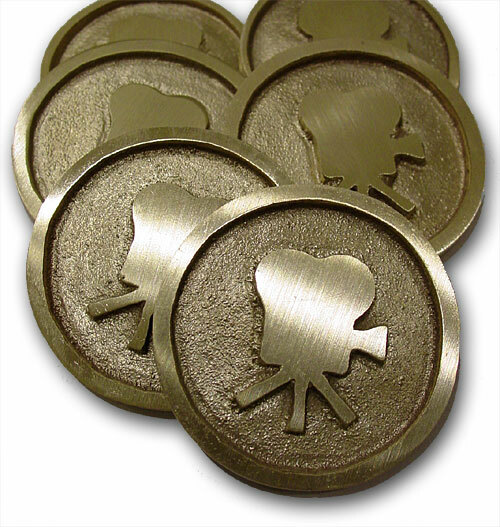 I just got the medallions, and I am very happy with them. I need to grind and polish them a bit to get them looking closer like the originals. It’s been a great experience… I’ve never sand casted anything out of brass before and it’s pretty amazing to see a brittle mold turn into something so rigid and strong. Now I need to start up part 2, which is to get the star outline and brass letters. I should have the pieces early next week… can’t wait. 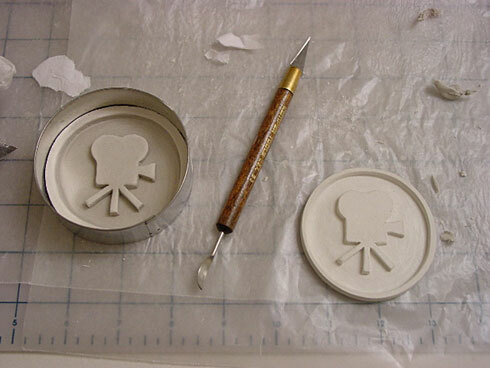 I just got a call this morning, and the casting company is working on the medallion today… They said the mold looks good, but I forgot to break the edges a bit more so the sand doesn’t get pulled out with the mold. He ground the edges a bit… should know soon if/how they turn out. 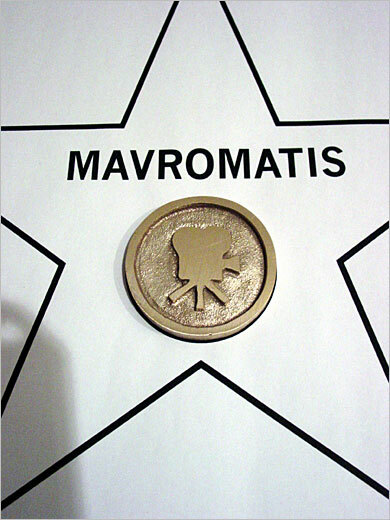 After seeing the 12×12″ ceramic tile based Walk Of Fame stars produced by skyman00 on the AVS Forum… I decided I wanted to attempt to replicate the original… down to the brass casting of the projector. I started this thread to capture the process I took to recreate it. I started off by calling the Hollywood Chamber of Commerce. I asked them if it was OK to replicate a Hollywood Star in my home, or if it was a violation of any sort. Their response was that if it was for personal use, I was OK. They even gave me the name and number to the company that makes the real ones. That will come later, when I actually start the terrazzo process. 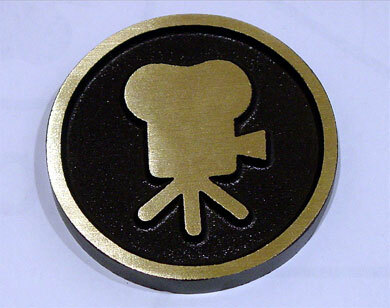 The hardest part of this whole deal has been how do I create a solid brass medallion? I don’t have a foundry and have never done such a thing. I found out a friend at work has some experience with casting and told me what I should do. 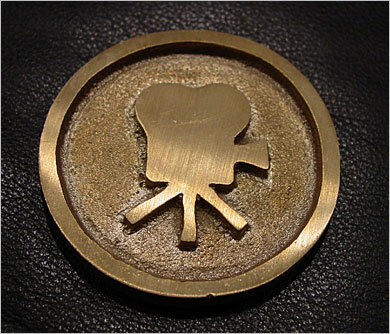 I decided I’d try sand casting the medallion since it’s only a one sided piece and easier to create molds for. 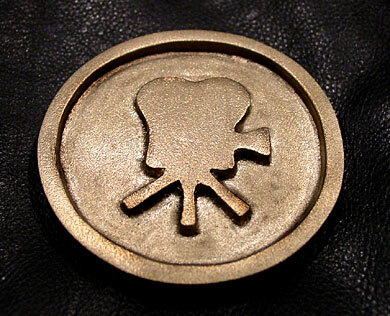 NOTE: For sand casting, you need a positive mold because it will be stamped into the sand and brass will be poured into the impression. I wanted to go with a poured mold, but that is very costly and beyond my knowledge. The star I’m going to make will be a smaller version… I want to install it in the floor, in front of the entrance to the theater. 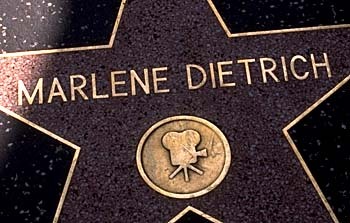 The star itself with measure about 14″x14″ and the black terrazzo area will be about 36″ x 20″. Next I had to buy some clay to start making the positive mold, I ended up buying a 1lb pack of Omyacolor Plastiroc Air Dry Clay. It’s great… very little shrinkage, no cracks. 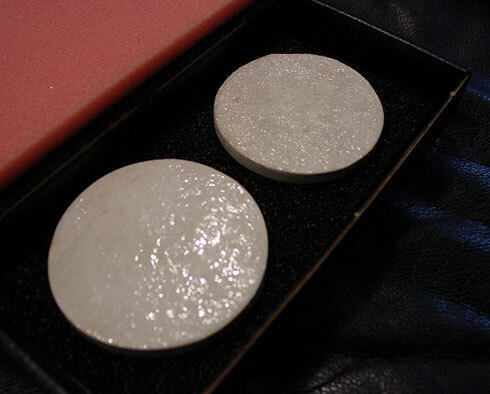 I made two molds… one is 2.5″ diameter, the other 3″. The 2.5″ one was done by hand (no tools besides an exacto knife… the 3″ was done with actual clay forming tools and a 3″ cookie cutter. The whole process took about an hour to form, and then another couple of hours to touch up and sand. The final piece with all drying time took about a week. The molds have been delivered… I should hear back next week about when I can expect them… hope to post the results in a couple weeks. 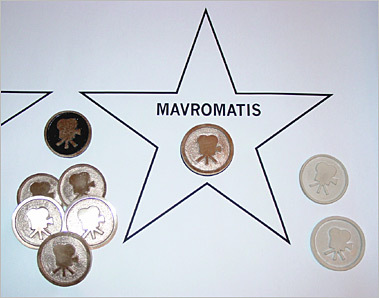 Until then… I’ll keep updating the process I took… if the medallions don’t turn out nice… then I won’t go any further. DIY: Patio Waterfall Feature — Copper Panels Coming Soon!